Don’t you just love it when you have do something twice? Maybe you’re like me in that you hate wasting time and doing something twice is even more aggravating. All too often this seems to happen when doing something for the very first time. Don’t you wish you could have access to the trade secrets of professionals that have done this many times before? It could eliminate all the guess work in what you are about to do. Knowledge and experience for whatever you are doing makes all the difference in the world and when installing a suspended ceiling, knowledge is king…that is unless you like the idea of spending countless hours on internet watching YouTube videos of people who don’t really know how to install a suspended ceiling. Hanging support wires for a drop ceiling can be tricky sometimes because you have all sorts of obstructions in the way like ductwork and piping. Here are a couple of tips to make sure you don’t run into a lot of problems. 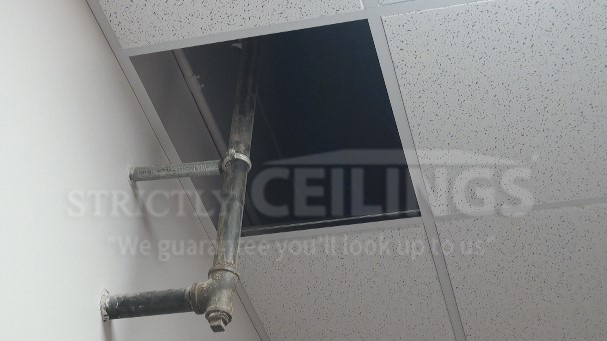 Lay out the ceiling properly before you begin. Make sure you watch either the “Basic” or “Advanced” layout videos. It will save you time and money. Once the borders are determined, mark the location of the main runners on the floor or have someone hold a tape measure and verify the main runner locations so that they don’t run underneath a duct or pipe. You may need to adjust the main runner location to accommodate the obstructions. If you cannot move the main runner to avoid the duct or piping there are two ways to fix this. (b) Double hang around the duct. Place a fastener on each side of the duct and hang a support wire from each fastener. 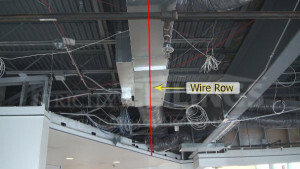 Use a metal pipe or any kind of strong metal bar and tie the support wires to it to create a bridge across the duct work. Then, hang your support wire off the metal bar. Note: This is an acceptable commercial application. Knowledge is key. Make sure you have thoroughly assessed the project before you begin. Don’t just start hanging the ceiling framework. Have the layout figured before you start to install and watch our installation videos so that you have a good understanding of how to install the drop ceiling. One thing I like to do, especially in basements, that is a real time saver is what I call the “Double Back Cut”. Many times when installing grid…the wall will not run straight or square with the ceiling and the border sizes of the grid will vary as you progress. When you cut the end of your main runner before you hang it, use your tape measure to scribe a line on the main to give you a mark and cut off the end of the main on the mark and notch out an additional one half inch on the top of the main. The purpose for this is that it will allow you to remove material off the end of the main if necessary to achieve square while the main is hung and installed. If you don’t do this and the end of the main needs to be cut shorter to achieve square then you’ll have to un-wire the main, take it back down off the wall and trim off a ¼” or whatever is needed. You’ll then have to re-install the main and check for square again. 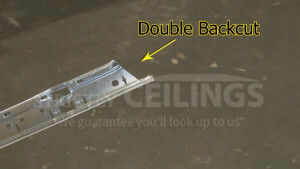 Double back cutting allows the main to remain in place on the wall and you simply pull it back, trim off the amount needed and recheck for square. A big time saver especially if you have tees already installed. First, assess the task and rough measure the tile exactly how you would if the pipe wasn’t there. Next, rough cut the tile and then measure both ways from the center of the tee bars to the center of the pipe. Remember to always measure from the factory edges and not from the cut edge at the wall angle. Carefully cut out the hole with your jab saw and then determine the best way to relieve the tile. Usually, it’s the shortest distance to the end or side of the tile…but it’s your choice. Using a utility knife, carefully cut from the end of the tile to the side of the hole on an angle. Make certain that you are beveling your knife while cutting. The bevel cut is so that when you reinstall the small piece it will sit on the tile and not fall out. Make another cut on the other side, remove the piece and set it in a safe place. Reinstall the tile and make any slight adjustments that are needed so that the tile fits snug around the pipe. Take the small piece that you cut out and place it into the tile. Scribe it…kerf it if necessary and reinstall it. 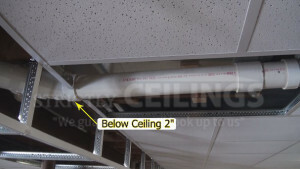 There are many other tricks and tips for installing drop ceilings in the “Tricks of the Trade” video. Take a look and see step by step instructions on how a professional does it.